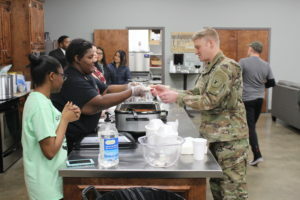 During the recent reopening of the Eagle Pantry, a Social Work Club member serves Army Staff Sergeant, Tad Snyder, a soup lunch. Only weeks before Christmas, the Eagle Pantry opened its doors for the first time with only one goal: fulfilling the needs of Northeast Texas Community College students. The pantry recently reopened its doors for the spring semester by offering the campus community lunch at the Wesley Fellowship Building and a tour of the Eagle Pantry. The pantry is open every third Thursday of each month in the Wesley Fellowship from 12:30 to 2:00 p.m. The pantry is available to all NTCC students with their student ID. Students are asked to complete a form showing need. Carmen Shurtleff, associate faculty to social work said the Social Work Club hosted the luncheon and tour to bring awareness to the food pantry as well as the needs of some of the students on campus. “We wanted to do the event to get more individuals over so they could tour the food pantry and we could get people familiar with the service and the process of accessing the pantry,” Shurtleff said. The lunch was sponsored by the NTCC Social Work Club, Wesley Fellowship and the Ag Club. Shurtleff said they were pleased with the number of people that came out and toured the facility and took part in the lunch. Students are beginning to learn about the pantry through flyers, informational emails, donation boxes, and advisors. Culinary student, Cory Dodson, expressed his gratitude for the Eagle Pantry. Along with food items, the group recently began accepting donations of hygiene products to add to the pantry. The club members are working on ways to spread the word about the Eagle Pantry to their fellow students, including those who live in the dorms. Shurtleff said the club has received a lot of interest and concern for students in need. If anyone would like to donate any non-perishable products to the pantry, boxes are located in buildings throughout the campus. Some items specifically needed include flour, sugar, peanut butter, cereal, Hamburger Helper, canned meats, tuna packs, crackers, mayonnaise, spaghetti sauce and miscellaneous snacks for dorm students. Needed hygiene products include shampoo, conditioner, razors, toothbrushes, toothpaste, body wash, deodorant and feminine products. The next date to access the pantry is Mar. 21. However, emergency needs can be met by contacting Shurtleff at cshurtleff@ntcc.edu.